Two years after the Barclays team first launched Blue Rewards – the bank’s first ever cash reward for customers – we were challenged with raising awareness of the scheme, and driving even more sign-ups. 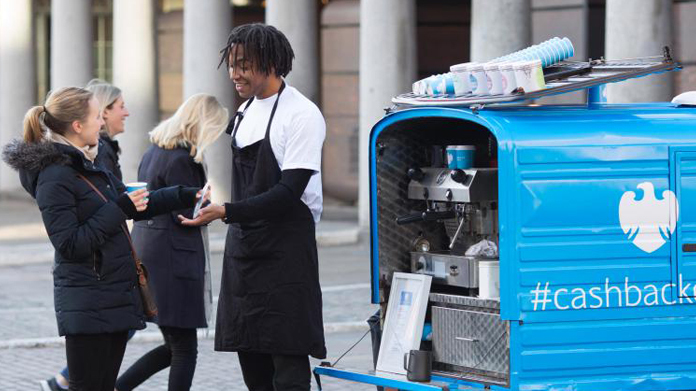 Focusing on the core offer – paying £3 a month to get £7 back – we took to the streets with a coffee van with a difference. Combining something early-morning commuters love (caffeine) and something pretty much everyone loves (free cash) we created our very own Cashback Coffee version of a Piaggio Apé. Visualising the £3-for-£7 element of Blue Rewards with cold, hard cash brought the digital-only transaction to life. Plus every punter got a free coffee and pastry to brighten up their morning. Coverage kicked off with The Sun, followed by Daily Mirror, Daily Star, Daily Express, Edinburgh News, Daily Record and Scottish Sun. Kicking off in London’s Covent Garden Market, the van drew suspicious glances, followed by tentative approaches, which quickly turned into long queues of commuters and passers-by … none of whom could believe their luck. For a week at least, there really was such a thing as a free breakfast.